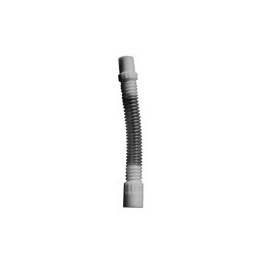 Flexible Teflon Connector (transparent/white) designed with 15 mm Male by 15 mm Female ends. Ends are firmly threaded into the convolutions of the tubing making it easy to assemble connections of different lengths. Connector is inert, long-lasting, lightweight, flexible, translucent, and heat sterilizable.